I am just ducking in to say, "HELLO" and ducking right back out to try and finish up your goodies for posting later or first thing in the morning!!! I am SOOOOOOO hoping that we do NOT have to go ANYWHERE this coming weekend or the next as THIS girl is PLUM-TUCKERED out and hopes to get A LOT accomplished this week!!! What have I been up to? He, he ...... wouldn't YOU like to know!!! LOL! Just kidding! I'm working on my FIRST contribution to the Treasures-to-Scrap monthly Treasure Chest and WOW, are these ever AWESOME designer collaborations. I shall keep you posted as to when it will be released! The one for April should be making it's way into the store any day and mine won't be available until May! (The color palette ROCKS and I've had WAY too much FUN making things - YES, my MOJO has come to pay me a visit and I'm hoping that it will stay through the remainder of the week ... and then SOME!!! WOO HOO!!! Next up, working on my GOODIES (did I say "goodies"???) 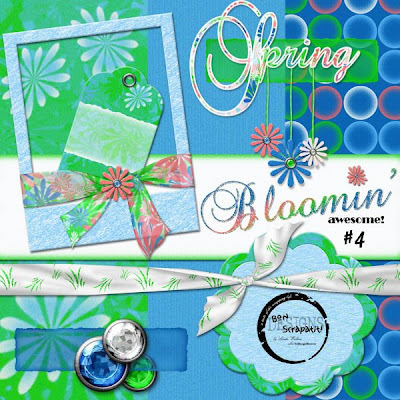 for National Scrapbooking Day at 3Scrapateers. This is ONE day you just don't want to miss as for any of you that have attended NSD at 3S in the past, know that we have LOTS of FUN and give out TONS of goodies and, of course, DEAREST Fernelda ALWAYS sprinkles her MAGIC dust about with LOTS of her OWN treasures!!! Mark you calendars NOW, kick-off is Friday evening, May 2nd and we party hearty all the way through to Sunday!!! OW, OWWWWWWW!!! YEEEEEE-HAW! I will be hosting both a chat and a challenge this year and I am EXCITED about both of them! Night all ... see you later or in the morning. Sweet dreams and may they be full of SCRAPTAPULOUS ideas! Would y'all believe that I spent my day AWAY from the computer yesterday??? Uh, huh ... I did, I REALLY, REALLY did! I hurt from head-to-toe. Ached as if I had the flu, but I didn't. Was it a FIBRO flare-up? Not sure about that either. All I know is that even the tops of my feet ached!!! Now that is just plain weird to me, but it's not the first time. Anyhoo, yours truly took a LONG nap on the recliner, cleaned the kitchen, fixed dinner and hung out with my darlin' watching television and EVEN went to bed EARLY ... like around ten-ish I believe!!! Now, you've just got to know that I'm under-the-weather when I don't touch my computer and watch television!!! ROFL! DEFINITELY something wrong there!!! I'm feeling more like myself today and still not sure why I felt SO bad yesterday, but I shant let that trouble me as long as I'm feeling well enough to be sitting right here, creating and visiting with y'all!!! LOL! P.S. The layout below is one that is down below in my personal slideshow. I put it here for those who've not traveled down to the BOTTOM of my blog to see it!!! 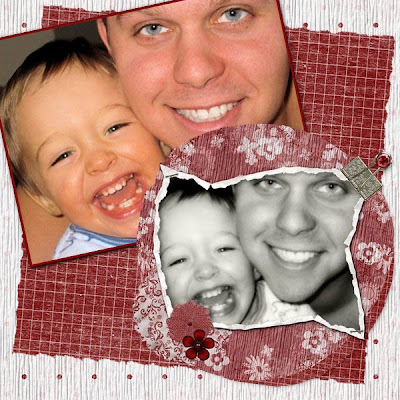 Just an idea of what I did with the MULTIPLE-PHOTO FRAME that is included in tonight's freebie download. PHEW!!! We had a GRAND Easter (pun intended! ), however, my day has been in SLOW motion today after spending a FABULOUS day in the sun and running around doing squats to capture the FUN and GAMES and, of course, our grandbabies!!! I will share some photos tomorrow! Natually, I had to snap a zillion frames to make up for the lost photo op last weekend!!! ROFL! Marlena, mama to Dillon, was SO gracious and said we really didn't miss anything, but Dillon did - his nap the morning of his birthday! She said he was cranky and didn't think he was feeling well either. Bless his heart. As Marlena described it to me, Dillon wasn't himself and when everyone sang happy birthday to him, he thought he was being yelled at!!! OMGosh! This is the same darlin' that worked the entire crowd at the last HUGE family birthday party!!! About 65 people showed and I can't help but think that was ENTIRELY too overwhelming for a little guy who is just not feeling up to snuff. I know how I feel when I'm not well. I just want to be at home and curled up on the sofa or in my OWN bed with my family nearby!!! If I were in the company of 65 people, I'd want to crawl under the table!!! LOL! Not very ladylike I know! I'd most likely excuse myself politely and then find my way to the car, recline the seat ALL the way back and drift off to sleep!!! YUP, that's what I'd do!!! How was your day yesterday? Anyone have any TALES to share??? LOL! We ended up NOT having an Easter egg hunt for the adults and we missed the one for the kiddos, so I am without photos of a GREAT hunt! Anyone have some they wish to share with me??? I'd LOVE to post them if you're willing! How about photos of the family dressed in their Sunday best? Any new hats, Easter bonnets? I saw one Mom strolling her baby girl through the park with her little Easter bonnet on - my camera was not retrievable fast enough to catch a photo of her! I think I was taking a wee bit of a break and enjoying some INCREDIBLY divine salad made by one of our newlywed nieces! Kimmi and her mom make the BEST salads I've ever had and as Del put it to me after I mentioned to her that Kimmi bagged some up and put it in our cooler for me ... "we've got YOUR number Linda"!!! Due to my inability to digest meat at the current time, I ate wisely so as not to aggravate my gall bladder and I snacked on fresh fruit, veggies and then my main meal of salad. But let me tell you, this salad was filling!!! It had a nice mixture of fresh greens, I'm thinking feta cheese, fresh raspberries and blueberries, cherry tomatoes, avocado and I'm sure a few other things I'm not remembering at the moment. I forgot to ask what kind of dressing, but I believe that it was something like a raspberry vinegarette!!! All I can tell ya is that it was YUMMY!!! John, one of my 18-year-old twin boys, was the only one not working or off somewhere else for the day, so he joined us and was finally able to meet Travis and Sofie's baby boy, Lohgan, who is now six months old! It was good to see John mingling with Robert's side of the family as he has not had the opportunity to do so for some time! With my boys not having any family nearby, it's really a treat for them and for me to see them "plugged in"! Okay, enough about my day, I would surely LOVE to hear about yours!!! P.S. There seems to be some intermittent troubles with my downloads via Media Fire. 4-Shared has removed the pirated files of mine so that they are no longer accessible, so I thought I'd give it a go again. I always check the links before leaving my blog. If you happen to come along to download before I've finished and you encounter any difficulty, please give it a few minutes and try again as if I find any snags, I will be altering the post to correct them! My downloads via 4-shared will be "password protected". Tonight's password is "charmed" (without quotation marks!) - remember passwords are case-sensitive and tonight's password is all in lower-case letters. Thanks for your patience as I try to find the best solution for all of us in getting my files to you! HAPPY EASTER Y'ALL AND I'M LEAVING YOU WITH ANOTHER LITTLE TREAT TO ADD TO YOUR *BLOOMIN' AWESOME* COLLECTION!!! WOO HOO!!! This bunny is HOPPIN' in to wish y'all a VERY "Happy Easter"!!! However you celebrate, or not, may your day be a SPECTACULAR one!!! Thank you for easing my conscience about missing Dillion's birthday party and, YES, Nancy, Dillon WILL be present at the picnic tomorrow and I hope to get a scruncha-buncha photos of him and his little cousins!!! Night all, sweet dreams and please be safe on the roads tomorrow if you are traveling. try again! Thanks for stopping by and HAPPY MONDAY! WHOA!!! IT'S THE SECOND DAY OF SPRING AND GUESS WHAT??? YUP! 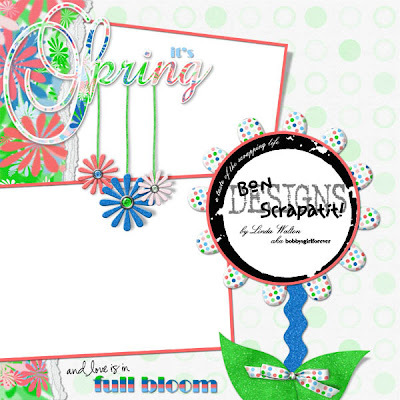 IT'S STILL BLOOMIN' AWESOME HERE AT BON SCRAPATIT DESIGNS!!! It's STILL *Bloomin' Awesome* because I have another mini addition to add to the collection from last night! I mentioned that I was not sure where I was going with this kit, which was my second-ever creation just about ONE year ago this time!!! I will most likely add a few things to it a little more up-to-date as it is pretty basic, however, I just ADORE the colors as they are SO fresh and just make me feel good when I look at them. I hope they make you feel that way too! 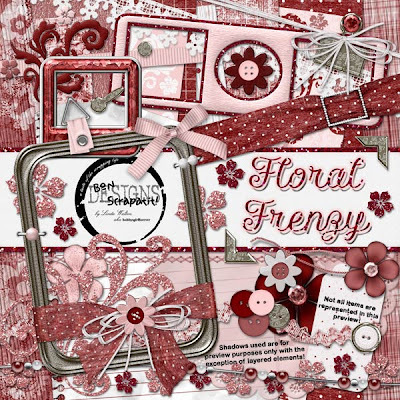 You will notice a SWEET little "butterfly" in this installment, which I've made from background papers in my *Bloomin' Awesome* collection and a FABULOUS template from a dear "fellow" designer at 3Scrapateers who goes by Nicecrane aka Ignacio!!! Ignacio lives in Spain, has taught Photoshop for 12 or so years now and creates the MOST incredible layouts each and every time!!! He is SO talented and I am SO loving every NEW product he comes out with in his store as they are all TRULY unique! Ignacio has some LOVELY collaged photo templates, straw frames (yes, they look like the flex straws that we ALL know and love), glitter frames ( ya just gotta KNOW that I LOVE these!!!) and even some BEAUTIFUL glitter styles!!! The list just goes on and on and I can hardly keep up with his NEW additions! Ignacio is also VERY intrigued with "origami" and has created some AWESOME digital origami items to add a UNIQUE touch to your layouts. Please pay him a visit, you won't be sorry and you will also find some VERY nice "freebies" on Ignacio's blog, which is HERE Some of his products are also for "commercial use". And, of course, y'all know how to visit my store as the links are always located right below my newest products at the upper portion of the sidebar here on my blog! Have you checked out my two newest editions yet. 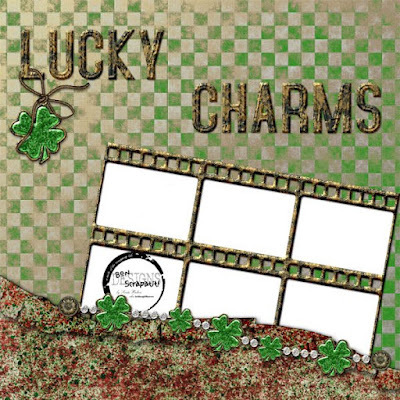 I know St. Patty's has already passed, but it's NEVER to late to scrap and *Shimmerin' Shamrocks* is SO versatile and does wonders with NATURE photos as well or even heritage pages ifn' ye be of Irish decent! Thank you SO much for visiting me and I wish you all a VERY Happy Easter and can't wait to hear what y'all do! All that to say this, we are going to a BIG family Easter picnic Sunday morning at 11:00 am! Robert teases me and asks if I'm sure it doesn't start at 1:00!!! Such a guy! He's a BONA FIDE nut! Keeps me laughing and I will NEVER fault him for that! So, NO birthday photos from me - just hoping to get them from other members in the family that attended! I will be taking LOTS of photos of the kiddos AND adults during their egg hunts at the park. We are also having a bar-b-que and I get to eat!!! WOO HOO!!! Love and hugs to y'all, have a WONDERFUL, WONDERFUL weekend and VERY special time with your loved ones. P.S. Sharon - I'm sorry to hear about your loss of electricity and hope it's not something that will be happening to you again any time soon. Was it weather related? I had six consecutive power outages last weekend and that has NEVER happened to us here before. It was really, really strange even! I forgot to remind y'all tonight that tomorrow, Saturday, is Osten Wilkins aka the DUDE'S grand opening over at OSTEN WILKINS DESIGNS!!! Hope to see y'all there - he's got LOTS of goodies for us!!! HAPPY FIRST DAY OF SPRING Y'ALL!!! WOO HOO!!! IT IS REALLY, REALLY BLOOMIN AWESOME!!! It has been a GRAND first day of spring here in Copperopolis! No, can't say it was short and sandal weather, but it was comfortable ... sweater weather, but at least it was not windy, rainy or snowy! I know that some parts of the country have been getting hit pretty hard. My friend, Osten (the DUDE! ), was telling me about the flooding in Missouri and I was able to catch some news this morning. WOW! One little bitty town was completely submerged under water. So sad for those that have lost their homes. I am just HAP, HAP, HAPPY to hear that the rains are subsiding and shall be hoping for minimal damage as the flood stages have not reached their maximum yet. For any of you affected or with family and/or friends affected, PLEASE be safe! Change of venue for tonight since it is the FIRST day of Spring! 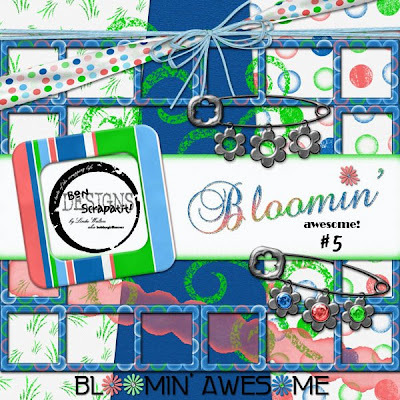 I am giving you a little mini-kit from my *BLOOMIN' AWESOME* stash. I'm still not sure what I wish to do with this, but thought I'd start with a little something and see if it just happens to BLOOM into something bigger!!! I will try to catch you up on the rest of my adventures tomorrow night!!! So much that has happened, has NOT happened and has YET to happen!!! LOL! I think y'all can relate to that, eh? Are y'all out participating in the BIG egg hunt that Shauna has going on with her Sunshine Girls and Guy??? I'm hoping to jump in and have some FUN and sure hope to find some GOODIES!!! I haven't been on a GOOD egg hunt in just about FOREVER!!! Lots of neato stuff going on out and about! I'm preparing for the DUDE'S "grand opening" on Saturday and hope to see y'all there. I got to take a SNEAK-PEEK at some of his SPECIAL treats and OHHHHHH my goodness! You'll just have to be there to check them out for yourselves! Have a BEAUTIFUL tomorrow y'all!!! WHAT'S FASTER THAN A SPEEDING BULLET??? NOT ABLE TO LEAP A TALL BUILDING IN A SINGLE BOUNCE? IS IT A BIRD? NOT! A PLANE? NOT EVEN CLOSE!!! And, NO, it is DEFINITELY not SUPERMAN or even SUPERWOMAN!!! The only likeness is that Superman lived in Metropolis and THIS GIRL lives in Copperopolis and is FLYING THROUGH TONIGHT in close to a WINK OF THE EYE!!! 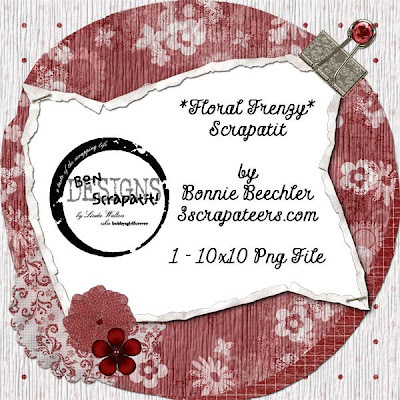 I am leaving you with a BLOPPER by our LOVELY Ms. Bonnie Beechler made from my *FLORAL FRENZY* scrapkit!!! I just LOVE that name - BLOPPER! Similar to a PLOPPER but carries it's own flavor as well as Bonnie's UNIQUE style! I've added a background paper behind it tonight and tomorrow I will leave y'all with it as a BLOPPER - one with transparency and one without tomorrow night. 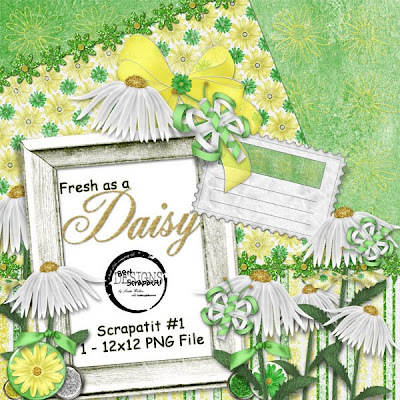 You can use one to put a photo behind as with the "scrapatit" you are able to download tonight and the other will serve nicely as a journaling matte or a photo matte with possibly a blended photo. Use your IMAGINATION and surprise Bonnie and I with something unique! BTW - if you'd like to say "thank you" to Bonnie personally, stop on by the 3S gallery HERE and leave her some LOVIN' on her DARLING layout that I posted last night of Kody and Carter! I know she will be SUPRISED and LOVING every moment of it!!! THANK YOU! Y'ALL ROCK ... and then SOME!!! I shall catch up with y'all tomorrow, God willing! I have spent most of my day posting my new kits out and about and have a bit more advertising to do and then I'm going to come out to play for a day or so!!! Oh, and make sure to mark your calendars for THE DUDE'S "grand opening" festivities over at OSTEN WILKINS DESIGNS this Saturday, March 22nd, as he treats us to a day of FUN and GOODIES!!! I hope to see y'all there! Let's SURPRISE him with a BIG 'ol LONG LINE clear down the street and around the corner!!! WOO HOO!!! Have a FABULOUS tomorrow y'all and BON SCRAPATIT!!! DAISY ... DAISY ... GIVE ME AN ANSWER DO!!! 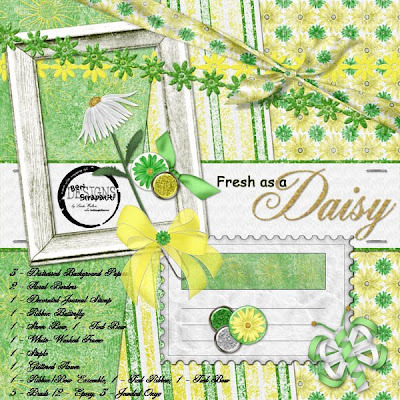 ANOTHER *FRESH AS A DAISY* FREEBIE FOR YOU AS WE CELEBRATE FANTABULOUS FREEBIE FRIDAY - WOO HOO!!! Greetings everyone!!! Today has brought me a little more relief from that which ails me!!! WOO HOOOOOOO!!! Just in time for the BIG birthday bash tomorrow as we celebrate grandson, Dillon's FIRST birthday!!! No, Robert will not be flying to Louisiana after all and his cousin had told him from the get-go not to worry about it! Flights are just WAY to high (another unintentional pun!) so close to the date. Grandma Foster was VERY well-known in Rayville, a VERY active member of her church and believe me, this is going to be a CELEBRATION of her life WELL-LIVED!!! So, just HOW do men handle such situations you might be wondering? Or, how is Robert handling the fact that he is unable to attend his grandmother's service tomorrow? Shhhhhh ... I know my SWEET man very well. He called me yesterday while running errands for me during his lunch break (dog food, printer cartridge, you know ... the necessities!) and informed me that he was NOT going to Louisiana and that he and several other people went searching for a flight (this included using a travel agency) and the lowest fare found was WAY out our league at the present time. So, how does a "man" compensate for such a disappointment??? Hmmmmm??? Well, he comes home with an NEW toy of course!!! Yep, that's what he did ... he bought himself a computer so that he can work on improving his keyboarding skills here at home as well as being able to learn more about his job as Gaming Commissioner!!! He's SO cute - just wanna squeeze him a little too hard sometimes! Oh, and he bought a very basic model without a monitor as he has one from work that he can use. He paid about half as much for it as he could afford to spend on an airline ticket. Ahhhh .... the things it takes to sooth the "savage beast"!!! Oh, I meant to say, "man"!!! Wise choice I must say as he LOVES to learn and this will allow him some extra study time here at home while I am busy creating!!! All kidding aside, Robert is really a VERY tender man and I've learned to read his cues rather easily, which I am EVER grateful for! THANK YOU, THANK YOU ... each and EVERY one of you for your prayers, thoughts and well-wishes as they are gratefully received and tucked within our hearts! Y'all are just TOO darned sweet, ya know? Okay, on to some business-at-hand! Tonight's freebie is an extension of my having "switched gears" while in horrific pain and unable to focus on my kit that needs to be in my stores! I created a layout and then made it into a "scrapatit" for y'all. I REALLY had fun planting my daisies and working with some custom shadowing!!! I LIVE to learn and each time I get the opportunity to spend a little time on something, I LOVE to play around and experiment. 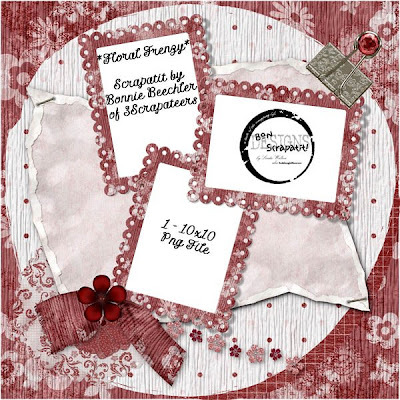 I hope you like it and, perhaps, find it something to inspire your creativity if you are fairly new to digital scrapbooking. I will be sharing TWO layouts with you tonight. 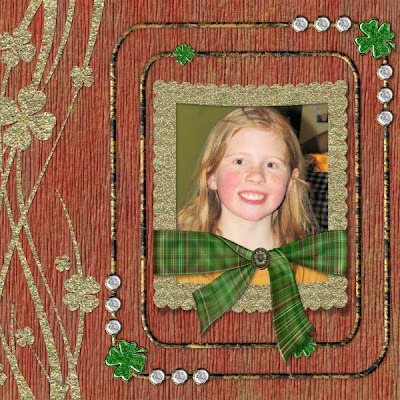 The first is a VERY special one that Elaine aka EVD sent to me of her PRECIOUS granddaughter using the freebies I posted from *Shimmerin' Shamrocks* - THANK YOU so much Elaine!!! 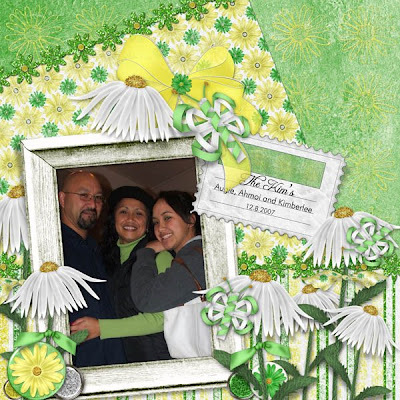 The second, is my layout using *Fresh As A Daisy* and is a photo of one of Robert's cousins and his family as we all gathered to celebrate his younger sister's "50th" birthday this past December! 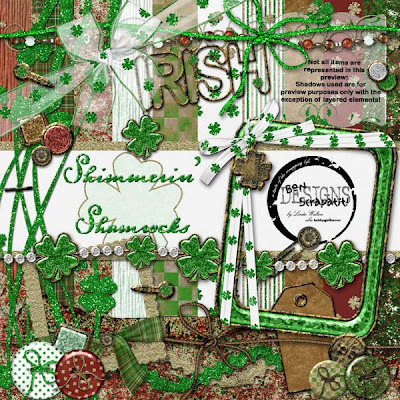 My nose is on it's way back into PS to finish up *Shimmerin' Shamrocks*, which I hope to be able to submit as my FIRST kit to Treasures To Scraps before leaving tomorrow and will also be uploading it to my store at 3Scrapateers before the weekend is over!!! I really, really need to find a balance in my designing as I seem to always find "just one more thing" that I wish to add and it goes on and on and on! I will SOON learn I'm sure! Have a FANTASTIC Friday night and a SPLENDID weekend y'all!!! See you tomorrow night or Sunday, God willing! Is she not just the SWEET EST little Irish lassie!!! MY CUP RUNNETH OVER ... WITH LOVE FOR Y'ALL!!! I'M FEELIN' FRESH AS A DAISY AND YOU WILL BE TOO!!! WHOA, YEAH, YAHOO and 'BOUT TIME!!! ROFL! Hi y'all!!! Just checking in real quick like as I'm just about ready to release *Floral Frenzy* and *Shimmerin' Shamrocks*!!! Just need to get all of my ducks in a row and they are GOOD to go!!! 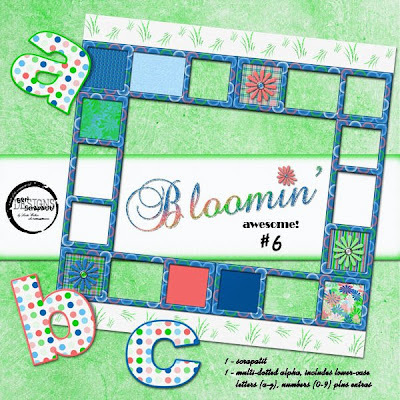 I will post the previews here on my sidebar with DIRECT links so that you can see them in my new store at Treasures To Scrap as well as my store at 3Scrapateers!!! I am SO excited and EVEN more excited since talking with daughter #2 on the phone just a bit ago. She is SOOOOO happy and that makes me SOOOOOO happy, of course! She and her fiance', Travis, will be taking their vows come August 16th in an outdoor ceremony in BEAUTIFUL downtown Vancouver, Washington. She just had to fill me in on ALL of the details and she has most everything in place with the exception of the photographer that they are still in search of! Now, I must be honest in telling you that the previous two paragraphs were written 24 hours ago, when I just had to give up and go to bed. As you know, I've been battling the digestive woes and I'm not quite sure what happened nearly two days ago, but it has had me "out of it" for the past two days straight! I was trying SO hard to get your freebie uploaded last night and just couldn't hang, KWIM? LOL! Anyhoo, I think I isolated the problem and am now working on that along with getting my kits prepared for uploading over the next 24-48 hours, God willing! I received an e-mail this morning from one of Robert's cousins in Louisiana informing us that his PRECIOUS little 96-six-year-old grandmother passed away this morning. I immediately called Robert at work as he had just spoken with her right after Christmas and she had even expressed to him then that she was "tired" and ready to go! We also found out that she had experienced a stroke in late January leaving her unable to speak. WOWSERS! "96" is A LOT of years and Grandma Foster lived a GOOD full life! Robert only met her 15 years ago as his father was killed in a car accident when he was still in utero. Robert's cousin, Coniece, assured him that she was, indeed, ready to go home and we all know she is now living pain free and where she longed to be! Anyhoo, things are a bit up in the "air", no pun intended as Robert tries to find a flight that we can afford. It is not easy to get anything reasonable when booking at the last minute and as it turns out, Grandma Foster's services are being held the same day as grandson, Dillon's first birthday party! Tomorrow, we will contact my future DIL's grandmother, who owns a travel agency, to see if she had hunt down a cancellation or an unfilled seat, etc. I shall try my darndest to catch up on unfinished business tomorrow. I still need to announce a few "grand openings" and post a SWEET layout I received using *Shimmerin' Shamrocks*! Thank you Elaine aka EVD!!! When I'm not feeling so good, or completely overwhelmed, sometimes the BEST remedy for me is to switch gears and attempt something TOTALLY "fresh"! Thus cometh, *As Fresh As A Daisy* and I must admit, I "am" feeling much better!!! WOO HOO! If I have missed anyone's question or comment the past several days, please don't be afraid to repost for me and/or e-mail me at lindawalton@caltel.com. I hope y'all are enjoying your week thus far and I REALLY hope that your FREEBIE tonight will FRESHEN things up a bit in YOUR day and in your scrapping endeavors!!! and they have removed the illegally uploaded files of mine! YAHOO! a FREE means by which to share our FREEBIES!!! SUPER SHIMMERING SHAMROCK SATURDAY and a NEW store in my future!!! Well, I'm on the fly again tonight!!! It has been one of those days when you've set out to do one particular thing and anything and everything that could, does distract you!!! Robert took the boys to WalMart for some belated birthday shopping and they couldn't wait to get home to show me their treasures and, of course, to play with them!!! They are really amazing young men! I've not heard a cross word between the two of them (then we don't live with them 24/7!) since they arrived and they just seem to perfectly content. Garret is actually on the sick side so I don't think he is quite his spunky self. He is such a HAM and is usually sneaking up on me several times throughout the day and giggling like crazy. He's mostly just sat quietly and played with his new "guy stuff"! He even went to sleep early, so I know he's not feeling so good - poor babe. Okay, I guess I've kept y'all in suspense long enough!!! I am spreading my little 'ol designer wings and will be selling my designs at Treasures To Scrap starting sometime next week I believe. Paperwork has been completed and they are getting me all set up to go, so just waiting for the word and I'm ready to move in!!! Tracy Madsen and Wendi Rees are the owners and are just as sweet as can be. I am VERY excited to be joining the ranks of some of my favorite designers! Yes, I will still be at 3Scrapateers, my HOME, SWEET, SCRAPPIN' HOME! It's like leaving home for the first time and stepping out into the BIG world that awaits you! I'm just a wee bit nervous, but know I'll be just fine and well taken care of! Sharon, your guess about Osten ... well, close but NO cigar!!! All kidding aside, once Osten is up and running, comfortable and established, he may start taking in other designers and yes, he has offered me a place to rest my wings too! I will quickly explain to you why I opted to go non-exclusive at 3S sooner than planned. Having started at 3S over three years ago, I never really gave much thought to why I would ever not want to be non-exclusive until I read about Tracy Madsen's son-in-law Trevor on Rina Kroes' blog and really wanted to do something. Well, I posted all about it here on my blog but really wanted to contribute my designs to the store at TTS to go towards helping the family. One slight problem. I was an EXCLUSIVE designer, which meant that I could NEVER create a thing for anyone other than 3S and it be sold for monies. WHOA! Wait a minute! Hold the phone! I'm now feeling like I've lost a freedom! So, I've changed my status to non-exclusive and am FREE to roam about SCRAPLAND!!! Love you guys and thank you for all the well wishes with the boys this weekend. They are a joy to have around and I actually get a BIG grin on my face when I walk outside of my room and have to step around toys!!! 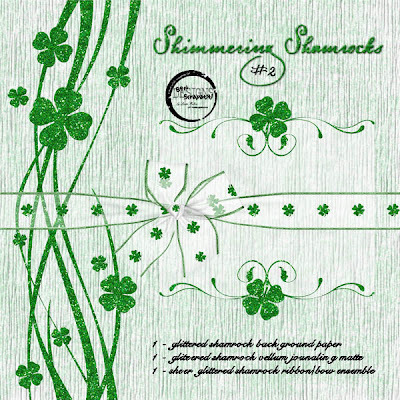 Night all and I hope you like this little addition to "Shimmering Shamrocks"! I just LOVE the sheer ribbon and bow thanks to Monica Larsen's NEWEST action at Commercial-Use!!! I had to place all of the shamrocks myself as I didn't like the way it turned out with the action, so I just re-ran it with a plain sheer ribbon and added the glittered shamrocks as best I could for realism! I bought some FABULOUS St.Patrick's Day brushes from a VERY talented lady from Croatia. Her name is Silvia and her site is Graphics-Illustrations. I will be adding her to my sidebar just as soon as GOOGLE figures out what they've done that we are no longer able to scroll but halfway down the page of our elements to add, remove or change them! I am not complaining as I am EVER thankful for ALL that they have provided for FREE and to one who is HTML illiterate and would be TOTALLY lost without them!!! SHIMMERING SHAMROCKS!!! I SHALL APPEAR AND THEN DISAPPEAR QUICKLY TONIGHT!!! Yeah right! I can hear y'all! Well, I mean it this time!!! I am finally making some progress and I REALLY need to finish up two kits before the "little guys" arrive tomorrow evening!!! YES! They are REALLY coming this time! Robert will be picking them up after work and they live about an hour and a half from where he works. WOO HOO and YOWEEEEE! SO, I shall see y'all tomorrow night and I should have one or, perhaps, TWO surprises to share with you!!! Tonight's FREEBIE is just a little token of my appreciation for y'all while you patiently await my surprises and my new kit releases, which I hope to have ready-to-go by the end of the weekend!!! 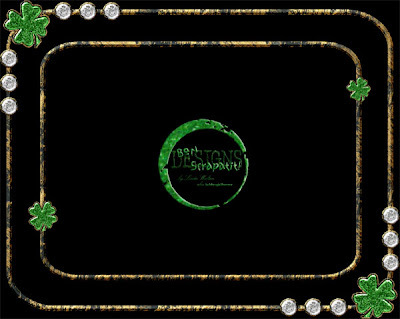 The Aged-Wire Shamrock and Jeweled Frame coordinates with my UPCOMING *Shimmering Shamrocks* and goes WONDERFULLY with the Shamrocks and Diamond Garland I included in the Scrapatizer for y'all last Saturday night!!! ENJOY! WOO HOOOOOOOOOOOOOO!!!! I'M SO EXCITED AND EVERYTHING IS JUST BLOOMIN' AWESOME!!! It's been SOOOOO quiet around here lately! Where is EVERYONE??? What am I missing??? Well, y'all have NO doubt been VERY, VERY busy as I have been! Before I go any further and forget, I would like to thank ALL of those participating in the past week's "Crop 'em and Swap 'em" at 3Scrapateers with Karen and I once again for making it such a BIG success!!! TOTAL count of BRAG BOOK pages in the gallery is 33 and Ms. Karen should be sending those out to all of us within the next day or two!!! That is enough pages for THREE entire albums without duplicating pages!!! WOO HOO and THANK YOU!!! Y'all make things SO much FUN and that is why I enjoy what I am doing - because it's FUN, CREATIVE and CONSTRUCTIVE!!! Thanks to y'all, I don't think I watch hardly a bit of television!!! I'd rather be right here creating!!! It's SO therapeutic and relaxing too! I REALLY am VERY excited about getting a few brag book albums put together quickly to share with our family when we go to celebrate grandson number two's FIRST birthday on the 15th!!! Oh, YES, even MORE photo ops there!!! And then on the 29th, we will be attending a BABY SHOWER for my FIRST grandson from the Walton clan!!! WHOA! Better make sure I download the birthday boy's photos first and be ready-to-go again!!! Another BUSY, BUSY year and here I was hoping for a few months at home with NO place to go!!! ROFL! That just DOES NOT happen in a BIG family, now does it!!! I would like to take this opportunity to thank those who brought to my attention that they saw some of my freebie images on another site. I would also like to explain a bit about how I feel about all of this without going into GREAT length as very simply put, my health cannot and will not tolerate it. While I do not have the stamina to go pirate hunting as many are, I do appreciate the alerts, but being a little older and, hopefully, a little wiser, I tend to handle things in a more diplomatic manner than exploiting people publicly as I've seen done recently in many places. I suppose at this juncture I might intercede with a well-known Biblical verse, "Let he who is without sin, cast the first stone". I am not saying that piracy is alright by any means. I'm just saying that as MANY before me have put it SO eloquently, Adobe has not stopped it. If major software companies and the age-old music industry HAVE NOT stopped it, then we won't be able to stop it either. I also feel it can be handled in a more ethical and professional manner. I, personally, do not believe in "public hangings" so-to-speak. I have heart disease (kicking myself for not sharing my story during heart disease awareness month in February!) due to accumulative stress. They could find NO other explanation as to why I, a completely healthy woman up until this time 3 years ago March 1st, at the age of 50 was having an angioplasty performed and a stent implanted into my LAD artery. Upon my own research (which is my second passion after scrapping, designing and photography), I came to the conclusion that I suffered from an accumulation of severe and traumatic stress for 4/5 th's of my life. That only makes sense as I lived many years in fear for my life and at times that of my children's. I was also diagnosed with PTSD (post-traumatic stress disorder). I also deal with Fibromyalgia which, in me, is triggered by stress. No, I do not like labels and NO I don't plan on being this way forever!!! It is up to me to bring a balance about and to curtail the things that bring about an abundance of stress in my life. DRAMA is one of them. For any of those experiencing a majority of their life in abuse, this is EASILY understood. So, long story short here, this body cannot get on the bandwagon with those that are pursuing digital pirates. Here is what I will do however. If I see another designer's creations in a place I don't feel they should be or I see their links provided and/or someone claiming said designer's goods as their own, I will contact said designer and contact the person violating said designer if easily accessible. Things that I will NOT do are get involved in forum dramas or post things on my blog that I cannot prove or back up as being fact. I'm sure you all realize that my enjoyment here comes from being able to help others to preserve their MOST precious and priceless memories and to be UPLIFTING and ENCOURAGING. All of this chaos has not been uplifting whatsoever. So, I'd just like to say for anyone who may not be privy to and/or is new to the Internet, digital scrapbooking, my blog and such, PLEASE respect the hard work of others and do not infringe upon their copyrighted work. If in doubt about something, ask. It is NOT ethical or legal to share another's work without their permission and you will be amazed at how willing people are to share when asked. If any of you have any questions or comments about this, please feel free to ask or comment and I will address them. NOW! I would like to return to my REGULARLY scheduled programming and offer you something UPLIFTING in the form of a FREEBIE!!! I have included the original layout I created your "scrapatit" from tonight as I really liked the way it turned out. It is nearly a year old now, but SPRING is right around the corner and down the street and I just think it's *BLOOMIN' AWESOME* and I hope y'all do to!!! I am offering "two" versions of this "scrapatit". One with a bit of journaling and the other without. Thanks for being the understanding, caring, compassionate and LOVING people that you are! Y'all ROCK .... and then some!!! See you tomorrow with some EXCITING news!!! WOO HOO!!! 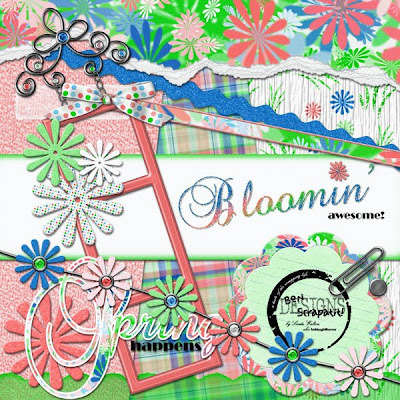 Layout created using *Bloomin' Awesome* by MUAH. Photos courtesy of MUAH! LAST DAY TO JOIN OUR "CROP 'EM AND SWAP 'EM ADVENTURE AT 3SCRAPATEERS!!! OH, SO MANY PRETTIES!!! 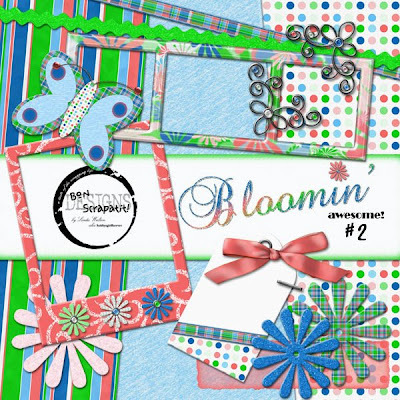 I can't believe how quickly the "Crop 'em and Swap 'em" Gallery at 3Scrapateers has filled up with such PRETTY and CREATIVE brag book pages for ALL of us participating to collect next week!!! A HUGE "thank you" to those of you that have already taken part and to those of you who have not as yet and may be pondering the idea, please go take a peek at the gallery now to see what awaits you for uploading at least ONE brag book page by MIDNIGHT EST, tomorrow night, March 3rd!!! I still have my additional page(s) to add as well, so it's NOT too late y'all!!! You will NOT believe some of the downright genius present in the gallery, which you can peek at HERE! If you need information on how the "Crop 'em and Swap 'em" challenge works, you may read Karen's guidelines HERE! 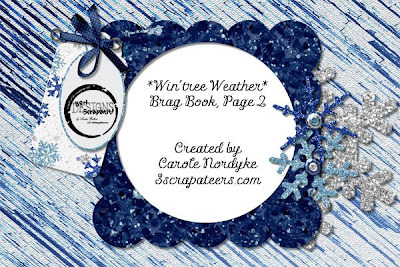 If you wish to participate and still don't have *WIN'TREE WEATHER* in your scrapping collection, you may find it HERE! And as a WEE bit more incentive to join us on this FABULOUS adventure, Ms. Carole Nordyke has GRACIOUSLY given one of her AMAZINGLY created brag book pages to me to give to y'all tonight!!! THANK YOU Carole!!! You SO totally ROCK girlfriend!!! Marie! Dearest Marie! Can you see me? I replied to your e-mail a day or so ago - I hope you received it. I just needed to know what program you are using. Sharon - I'm SO happy to hear that you are feeling better!!! WOO HOO for the both of us! Sue, if you happen to catch this post, I have used digestive enzymes and should actually use them on a regular basis and will do so once I've completed my program. It actually contains LIVE enzymes in all of it's products so I'm good-to-go there. Sure does make a HUGE difference though, doesn't it sweetie? I'm just HAPPY to hear that you've found an answer for your digestive woes!!! YIPPEEEEEE! OW, OW! Okay, this girl is off to bed before she gets WAY too giddy! 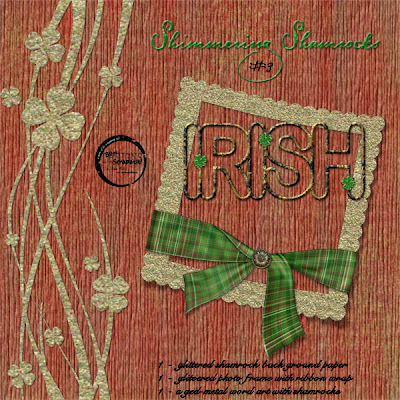 THANK YOU to all of you who have left comments on *SHIMMERING SHAMROCKS*!!! You are MOST welcome and YOUR enjoyment is my reward! Until tomorrow ... SCRAP HAPPY Y'ALL!